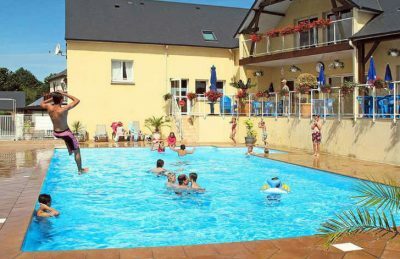 Camping St Michel is a lovely campsite that is set within 5 hectares of beautifully landscaped grounds amongst the fantastic Normandy countryside. The campsite as you’d expect gets its name from the stunning nearby Mont Saint Michel which lies just 8km away to the northwest. Mont Saint Michel is one of the most popular tourist attractions in France and has held the status of UNESCO World Heritage site since 1979. This part of Normandy benefits from some of the flattest landscapes in the region making it highly popular with more active holidaymakers. Cycling and walking are massively popular and the campsite makes an ideal base to explore all that’s great with the area. If you’re really looking to get out and explore then the nearby popular seaside resort of Granville should be on your list of places to visit. The resort boasts some wonderful beaches that are great for a family day out and there are also regular ferries which head over to the Channel Islands allowing you to explore Jersey and Guernsey. Although Camping St Michel makes an ideal base, those that prefer to stay on-site will love the outdoor heated swimming pool and sunbathing area. Here you’ll be able to sit back and relax on sunny days whilst the kids play around in the pool. Camping St Michel campsite offers a comprehensive selection of activities and facilities on site and also nearby to ensure you have a fantastic family holiday. On-site activities at Camping St Michel campsite include table tennis, boules, cycle hire, a small farm with a variety of small animals and a playground. Facilities available at Camping St Michel campsite include WIFI, pizzeria, takeaway, bar, grocery shop, animation team, tv room, games room, washers and dryers. Accommodation at Camping St Michel campsite includes 2 bedroom mobile homes that are available from Suncamp. You can also book camping pitches for your own tent, mobile home or caravan at Camping St Michel.